We'll be on Steam with a beta very soon now - one more bug/new feature to get right (custom mouse cursors for much better left-click interactions) and then we'll be there. We have been spending a lot more time on examining the user experience for new ADOM players. And it's without doubt still horrible (although much better than 12 months ago). I sadly have come to realize that we have been making a mistake (as hard as it sounds) by mostly discussing UI/UX within the existing community. The existing community mostly consists of too many roguelike/ADOM experts who just fail to see (like me) what barriers these games pose to general players. Finishing the crowdfunding promises (which we hope to do this month!). Getting ready for the Roguelike Celebration (meet me there) and big announcements. Will the new steam version have all the recent changes (ie: the new mini maps etc)? Eta a couple of days? No. We are currently getting up to speed for mich more regular releases. 2.3.5 will have have the Rolf and Volcano quests and tons of stuff related to that. 2.3.6 will most likely contain a ton of UI/UX changed. 2.4.x will contain all the remaining crowdfunding promises. All three are under parallel development due to the blessings of our new GIT infrastructure. If we finally get this huge 2.3.5 release out we‘ll be able to pick up much more regular releases. If I may be frank, while I love the idea of making things more intuitive, I don't think you are giving new players enough credit. I actually started playing a couple of years ago as a new player to roguelikes. I loved the game because it had all kinds of things to do and be aware of ( like hunger, corruptions, difficulty, secret doors). It gave ADOM its uniqueness, and it's why I love it. A lot of the ideas from the forums look great, as I think what scares a lot of players at first is all the commands and things you can do in the game. That is a good thing to make it easier that I think old and new players can appreciate. Regarding credit: I think it depends on what aspect to credit: For me the long(er) time ADOM resemble olympic athletes (as players) optimizing a high end training machine (the game). 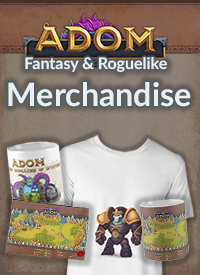 The ADOM community is mind-blowingly awesome at suggesting great new content, balance optimization, refining details of monsters, items, stories, etc. 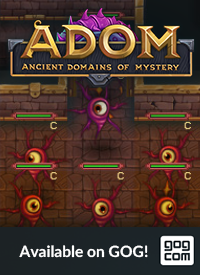 (you all really are the best and most of what ADOM has achieved has to be credited to its awesome community) but if we look at the user interface... well, it's optimized for high end players but it's an apocalyptic mess for most new players. 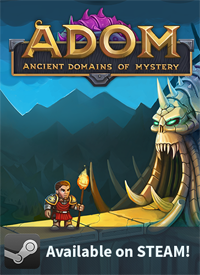 You just need to sit for an hour or two next to a normal gamer trying to make sense of ADOM and you will become very humble if you think that the ADOM UI is great (or good... or decent). It's not for new players. Someone remarked if ADOM should target players that fail to understand the UI - and I would say yes, because otherwise it is doomed to die in a niche. And for me ADOM has too much potential to die in a niche as I truly believe that the UI can be greatly improved. Sadly the established community (and myself either) so far haven't been very good at making ADOM more accessible. That's what I'm willing to change. And hopefully we will be successful. Also, when do you think we can get the steam beta? I'm DYING to play with all the new stuff! this might be stupid question, but what is UX?